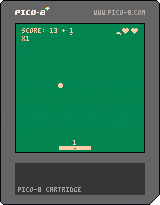 A small venture into the territory of the fantasy console PICO-8, Squashy is a game heavily based on a basic pong/breakout game. However, the old gameplay pattern is twisted to push you towards prediction and risk-taking. I focused on making the whole game juicier as well.